Eating while pregnant can be a challenge, from morning all-day nausea to food aversions to heartburn and the different food safety considerations for you and your baby. 1) Prenatal vitamin. I’ve been taking one since I signed up for maternity insurance, about 6 months before we started trying to conceive. It’s important to get your iron and folic acid stores to optimal levels before conception. Of course real food is the best source of nutrition, but most doctors and dietitians recommend a prenatal to ensure you’re getting everything you need. I take Whole Foods brand prenatals. They are plant based, have some DHA (from algae), a few bonus nutrients like probiotics and haven’t bothered my stomach at all. One point to note: I almost always start my day with a boost of calcium from yogurt, milk or the like. Yogurt for lunch or a snack is also a frequent occurrence. Since the body can only absorb so much calcium at once, I take my prenatals with dinner when I’m less likely to eat dairy. This helps distribute the calcium more evening throughout the day. 2) Juice [as well as lots of water!] Juice isn’t something I’d normally keep in the house because I prefer to eat whole fruit that comes with fiber and chewing power. But during the first trimester, I craving OJ out the wazoo. Perhaps because it’s a good source of folate! I discovered early in pregnancy that I wake up so thirsty and a glass of water combined with an energy boost from juice made me feel much better much faster than if I had taken the time to peel an orange and chew it (which at times sounded awful). I also use juice right after a workout (a swig here or there) for a quick replenishment or as a cure for blood sugar-induced insomnia in the middle of the night. Look for juices that are 100% juice with no added sugars if you can and keep the portion relatively small. You just need a boost, not a sugar high! 3) Protein. The average female requires about 0.8 g/kg of protein a day, whereas the requirement during pregnancy jumps to 1.1 g/kg of body weight. I tend to get my protein from dairy, beans, whole grains, cheese, eggs and a small amount of meats at dinnertime. These got me to ~50 grams no problem. But to get to closer to the 70 grams or so that I need during pregnancy, I’ve been focusing on getting more protein with every meal. Sources I have added include eggs, almonds/nuts, meat (double boost of iron if it’s red! ), sardines/fish, extra portions of beans, drinkable yogurt, string cheese and cheese, and the addition of a glass of milk to a meal. A glass of milk is probably the easiest way to add protein to a meal with about 8 grams per cup. Soy milk is a good plant-based option, but almond and rice milks are much lower in protein (which is why I never drink them). I bought a few protein powders (either grass-fed whey or plant based. Vega is my favorite plant kind.) but I try to choose real food as a first defense (yogurt, cottage cheese) for a smoothie before turning to protein powder. Good to have in the house though for when you’re running low on fresh things and are totally craving a smoothie. 4) Iron. Iron is very important during pregnancy due to the huge increase in blood volume. During the first trimester, I craved red meat and ground beef like crazy for a few weeks. Pregnant women craving hamburgers are probably more iron and protein cravings than “junk food” cravings (it won’t be junk food if you use good grass-fed beef or bison and keep the portion single-decker and the fries to a minimum!) We had tacos and burgers quite a few times to satisfy those cravings. After a while, my cravings went on to other things (pulled pork for instance!) but I’ve still chosen red meat more than I might normally just for the nutrition. Leafy greens and beans are the other great iron sources (among other foods) and we try to eat them a few days a week. Note if you’re a vegetarian it’s ideal to consume these with some citrus for optimal absorption of non-heme iron! It’s a good thing I am an omnivore because I couldn’t tolerate the thought of either of these two things in the first trimester, so I was able to get iron from meat. My prenatal also has 18 mg of iron. I asked my OB if I needed any additional iron supplementation (hoping she’d say no if I’m getting the rest of the 27mg or so that are recommended from food) and she said that my iron was great at my first appointment and they would check it again at 28 weeks when they do the glucose test, so for now I feel good. 5) Calcium. Calcium is a very important pregnancy nutrient! Aim for 1,000 mg a day to ensure your bones don’t get depleted as the baby uses calcium to build bones, teeth, etc. Milk and yogurt are my favorite sources, along with sardines (!) and veggies, but don’t underestimate cheese or ice cream! Choose a natural brand like Breyers All Natural. I was surprised to find that there is less sugar in a half cup of Breyers Vanilla Bean than in a typical fruit on the bottom yogurt! The important thing about ice cream is to keep the portion size small and choose a natural kind (not the loaded-with-candy-bar or processed ingredients kinds!) Bonus if you can find organic/grass-fed milk versions : ) This is one pregnancy craving that I enjoyed to the max. 6) Fats. Fat is important for baby’s brain and nervous system development, so now is not the time to go all fat-free on your diet. 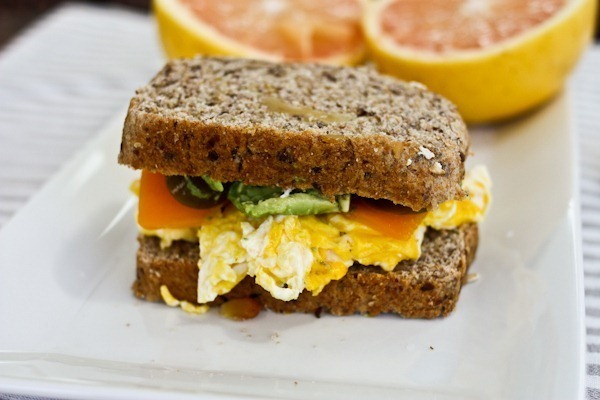 Avocados are a great source, and I’ve been trying to buy one a week to incorporate into sandwiches and lunches. 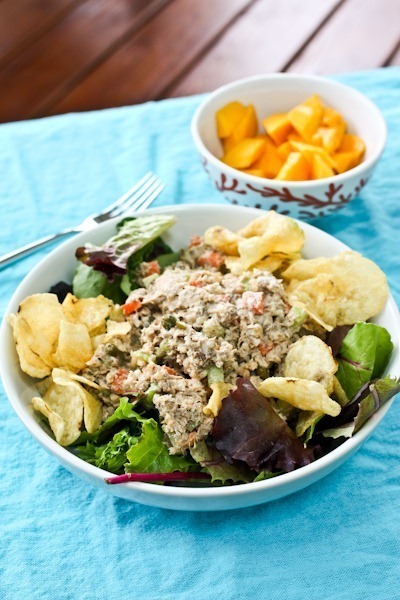 Nut butters, olive oil drizzled on a green salad and cheese are also delicious ways to enjoy fats. Twinkies and trans-fats….not so much. 7) Listeria risk + raw cheese. One of the “rules” of pregnancy eating is to avoid deli meats and smoked meats that have an increased risk of containing listeria, a bacteria that can harm a fetus without you even getting sick yourself. This doesn’t mean you can’t ever have turkey or smoked salmon, but it is recommended that you heat it to steaming first. Yeah, I know steamed smoked salmon sounds like an oxymoron, but I’d rather have it steamed than not at all I love it so! Several people have asked me how I have been able to enjoy goat cheese and blue cheese since soft cheeses are on the no-no list. It’s because it’s really unpasteurized soft cheeses that are not recommended. Here in the USA, those are rare to come by, but they do exist (my beloved goat milk feta cheese is raw, for example). So I just ask restaurants (especially fancy ones) if their cheeses are pasteurized and then you can goat-cheese away! You can also enjoy sushi!! Just choose cooked versions and stay away from the higher mercury fish (like Yellowfin tuna, which wouldn’t be cooked anyways). 8) EPA + DHA. I’ve looked into taking omega-3 fish oil supplements many times throughout my nutrition career. My decision was finalized when I talked to one of my internship mentors who had been involved in extensive omega-3 research. 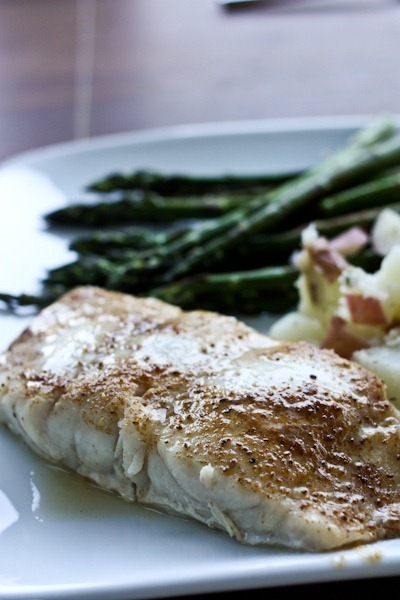 She shared with me that eating a fish high in these essential fatty acids twice a week was ideal for intake. So when I asked her if she thought I should be taking a supplement, she simply asked me: “Why not just eat more fish?” Duh – that seemed like the obvious solution! Fish is a bit hard to handle in the kitchen. It’s expensive and you have to eat it the same day you buy it for optimal freshness. But canned or frozen wild Alaskan salmon and sardines are cheap and shelf stable, so they are my go-tos for omega-3s. Since pregnancy, I’ve been trying to eat salmon or other omega-3 fish twice a week. I have to say that this wasn’t always possible (ironically salmon was one fish I could not stand during the first trimester) but now that I’m in the second and feeling much better, both are back on the menu. I’ve been buying frozen wild salmon because it’s easier to manage in our meal plan than fresh, and sardines made a comeback this week. This site was recently sent to me as a great resource to cook fish directly from your freezer. I’d much rather spend my money on a fish that comes with protein, calcium and flavor than an expensive pill I have to swallow everyday. I don’t eat fish as often as I should, but I’m working on it. 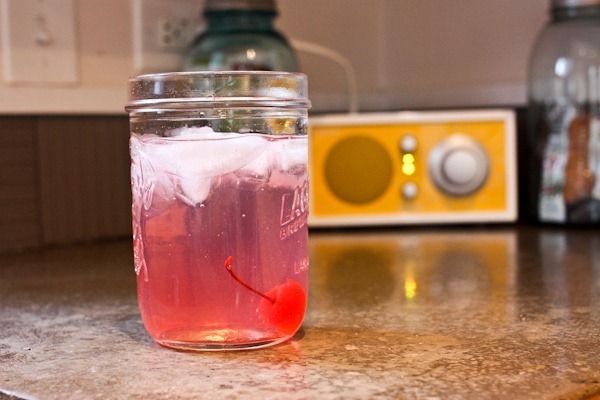 9) Mocktails. The biggest reason why I love alcohol is for the process of drinking it. I love pouring something to sip on while I’m cooking dinner or swirling around ice cubes in a glass at a party. Rather than cut out cocktails, I’ve just replaced alcohol with a variety of mocktails. From cherries fizzing in sparling water to asking restaurants if they can make me a virgin version of one of their drinks, this has made all the difference in participating in the social aspects of drinking. While a part of me does ache for a potent glass of red wine or a few glugs of a malty and sweet Belgian strong ale, I really haven’t missed the alcohol much at all. My favorite mocktails have been the lemon/lime/simple syrup martinis I’ve had (any bar should be able to make that if you describe it!) and the Spice-a-rita made with limeade at Mono Loco. Better than the original! 10) Caffeine. The research says that 200mg or less of caffeine is safe, but since I had weaned myself off coffee due to its addicting and jittery/headache effects on my body the year before I got pregnant, giving up coffee wasn’t a big change for me. I still drink a cup of black tea nearly every morning (~40 mg caffeine) and have had several cups of real coffee and sodas with no worry because they aren’t part of my daily life. But since it’s easy enough to choose decaf coffee, I usually just opt for that over regular, more because I hate coffee’s effect on my sleep cycle and body than because I’m concerned about the safety. 11) Don’t stress. There were definitely a few days during the first trimester where I ate very poorly. Nothing green, too many carbs, too much sugar. But for the most part, I was able to sneak in nutrients even when I couldn’t stand the thought of them. Take advantage of your cravings and just do the best you can. 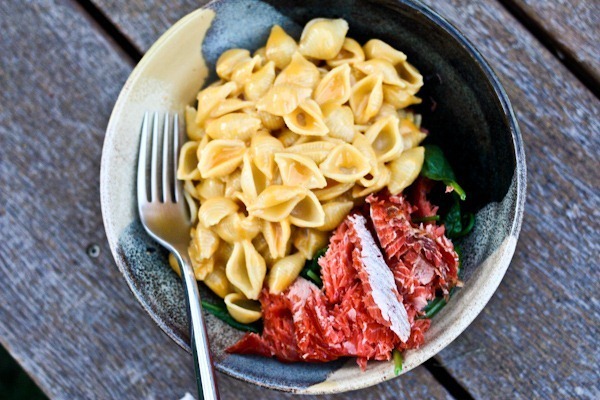 A prime example: mac and cheese (craving!) with a small amount of greens (on the bottom) and some salmon. I took a comfort food craving and amped it up a bit with pregnancy superfoods. Another example we had a few times: a meaty tomato sauce with spinach and zucchini (in small pieces!) stirred in over whole wheat pasta. All of those tricks people sneak into kids’ foods – use them on yourself! For a while a green smoothie was the only way I could get in salads at lunch, so I had one everyday for a week! 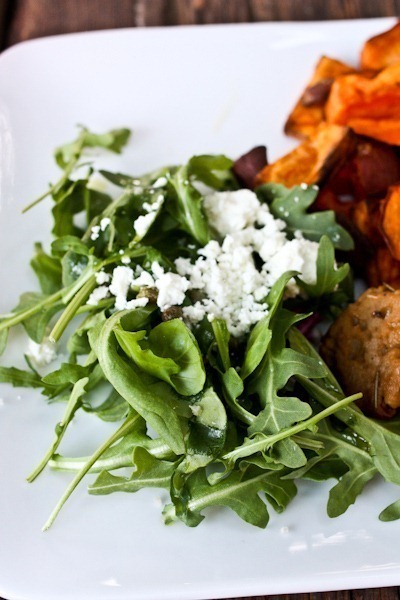 Now the only kind of salads I like at home are simple greens with lemon juice and a fun topping (like goat cheese! or hummus) so that’s what you’ll find on my plate most. Many of you wisely told me this in earlier posts, but I’m here to repeat it: don’t stress too much about weight gain either. I had a big gain in weeks 12-16 when I found my appetite back and strong, putting me on the high end of weight gain charts, but I barely gained any in weeks 16-20. I really do believe that everything will balance out so long as you’re making a good effort to eat well. I’m back to eating 3 meals a day plus a snack, swig of juice or dessert here or there, and so far my doctor says my weight gain is right on track: about 10 pounds in 20 weeks. All in all, pregnancy hasn’t changed my diet that much. Just a few tweaks here or there and a bit more conscious though into getting more of the things I need most. Please note that while I am a Registered Dietitian, it is important to check with YOUR doctor when you have any questions regarding your pregnancy diet, as individual circumstances may differ from person to person. What a great post! This should serve as a great (and reliable!) resource for many women. Everything look accurate 🙂 ? Last I looked, there was not any good research on cravings related to nutrition deficiencies. I think you’d have a tough time finding a solid research study supporting cravings related to meat/iron intake. There are some interesting studies in pregnant women, taste buds, and salt preference during the third trimester that the authors hypothesize to increased blood volume (first auther is Duffy). When I was pregnant with my 1 year old, so much of this list I obsessed over! Now that I am pregnant with #2, I have completely relaxed. My diet is pretty good so I guess that’s why I’m not stressed but also my life has changed. I gave up coffee with #1 — now I do need 1 cup to get through the day! Listeria is pretty rare but the times I have eaten questionable things, it’s always been from a reputable source. For some reason I cannot tolerate any seafood since baby #1 so I swear by Nordic Naturals DHA 1000. I took it while breastfeeding (per ped. recommendation) and I think it gives me a boost in energy overall. For calcium, since I am not great about dairy, I chew on a few tums. It’s the easiest for me and usually helps me when I am feeling off. The calcium thing is huge not only for pregnancy but nursing (which I am still doing) since depletion can lead to osteoporosis among other bone issues. I would also add Vitamin D3 is good for anyone but helpful for women. On the sneaking in veggies — yeah, they know. I found a lot of new eaters go through a finger-food only period and it’s like they have a superhuman ability to reject anything good for them. Thankfully, it comes in waves! I really enjoyed Ellen Statler’s (I can’t remember how she spells her last name) book Child of Mine when it came to psychology of feeding children. My take-aways were that so much of food can be control for kids and it is important to realize they may not eat right for a day or week but overall, like pregnancy cravings, they will get what they need over time. On a related note — skip purees! I see so many Moms who start with pureed baby food and at 12, 14 months, they are struggling to get their kid to eat anything but cheerios and mushed up bananas. We made things very lumpy and soft (think if you were an indigenous person, you wouldn’t throw foods in blenders) and gave her what we ate for the most part. Their gag reflex is better than you think and their gums are super powerful. She has her picky moments but she’s a great eater and I think our early adoption of real, whole foods has helped. Either way, a kid will eat real foods but it can be a little more time consuming and stressful along the way. Make it easy on yourself. LOVE this post! I’m in a nutrition course right now (doing science prerequisites to apply to master’s programs to get my RD!) and we’re doing pregnancy nutrition right now. I spent many enjoyable minutes chatting with a pregnant friend about all her meat cravings! I have a question about meat, specifically steak: I noticed that you ate medium-rare steak when you were pregnant. I had heard mixed recommendations about proteins that weren’t cooked well done. What went into your decision making on that? I second that, what a great, informative post!! Awesome job. Thanks for this really helpful post – it’s a lot to navigate and I have enjoyed reading online in your easy to understand posts 🙂 In your research/dietary work, have you heard of any links with amount of nuts consumed while pregnant and allergies in kids? I’ve heard conflicting things like if you eat too much or if you avoid it altogether, your children can have peanut allergies. Just wondered if you had more reputable information than what I have found! I have heard this, but my doctor and my pediatrician weren’t concerned. I ate peanut butter nearly everyday and neither of my girls have any allergies. Great post, Kath! I really enjoy reading BERF and your perspective on nutrition during pregnancy (except for those Hidden Valley Ads, sorry!). I have Celiac disease, so eating grain-free is non-negotiable and I’ve naturally shifted towards a more Primal/Paleo diet. My first trimester of pregnancy has been SO tough from an appetite perspective, and I’ve broken down and bought gluten-free bagels, Annie’s Rice Mac n’ Cheese, and plenty of other stuff that is basically processed junk food marketed under the guise of “health food”. My pregnant self has a terrible time resisting it. In an ideal situation I would be getting all my nutrition from sustainably raised/organic meat, fish, and veggies..but I can hardly be in the house when my husband is cooking meat these days. I realize this is passing and I’ll be back to healthier habits soon, much like you were. The one thing I would question you on is soy milk. While I can’t disagree that it provides protein, I have read many negative things about phytates and soy’s goitrogenic and estrogenic properties. Plus it’s hardly ever mentioned that any milk substitute/alternative you use will contain added sweeteners unless you specifically look for the unsweetened version. I know this is a polarizing opinion and there are plenty of healthy happy mamas and babes who are soy-eaters so of course one size doesn’t fit all, but I do challenge you to do some research if you haven’t already. This is good to know. Thanks! I drink soy milk daily as I am supposed to limit my dairy intake (digestive issues). I decided on soy over the almond/coconut/rice versions etc due to the upped protein count in soy milk. Seemed like the next best choice if not consuming regular cows milk. Good post. I have had a really hard time feeling like I was doing a good job the first two pregnancies in terms of a balanced diet. I suffered terrible nausea 24/7 and with that aversions to all vegetables and fruit the first trimester. It seemed like I could only stomach white carbs. In turn, I think I felt worse. I also put on more pounds than necessary first tri (did lose it all each time). Now I am navigating my way through pregnancy #3 and have the same awful nausea (nearing the end of that phase hopefully ). It’s tough, especially with two little ones to chase and a full time teaching job. I have somehow figured how ways to get veggies in half the time and lots of fruit. I have tried to avoid the fries and chips (which I overdid the first pregnancy BC they gave me temporarily relief). I still eat more white carbs than I would like, but sometimes the only thing I can stomach is a bagel with cream cheese, cereal or pizza. I do feel best when I keep it bland. I am really looking forward to (hopefully) adding back in the salads and healthier eats as I hit up the second tri and head into summer! Also, I skipped out on puréed foods with my second child (sure I mashed up and made sure it was safe) with my second child and she eats ten times healthier than my first, who ate baby food from 6-12 months….every veggie and fruit under the sun- she loves- while the other is stuck on pasta…. 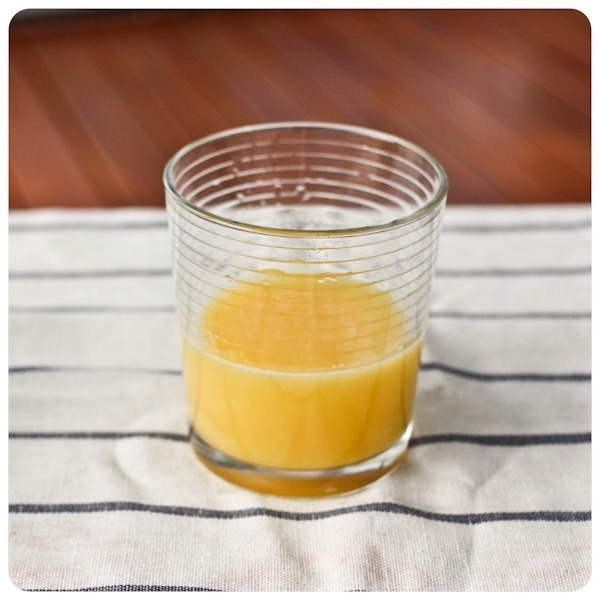 I craved OJ too, and chocolate milk – two things I would never keep in the house before. I’ve seen hummus as a green salad topper/dressing all over food blogs but never tried it myself. Do you mix it in or just dip? Vitamin D3…HUGE oversight 🙁 Women should get the 25-hydroxy D blood test for vitamin D and then work with their doctor to determine how much they need. For example, the recommendation is 600-1000IU, however, this is FAR too low for most to reach adequate levels, let alone optimal. I need to take 5000IU/day just to maintain an optimal level of vitamin D.
We are getting ready to start trying for our first baby early next year and I really enjoy reading your blog! You have the best recommendations – I have already downloaded a couple of pregtastic podcasts and have created an account with Ova Ova, thanks to you:) The thing that peaked my interest in this post is maternity insurance. This is the first I’ve heard of it, can you please explain its purpose? Thanks! It’s very individualistic, so you’ll need to check with your plan. If you have it through work, then you probabbbbbly already have it. We are self-employed so we pretty much customize a plan to our needs. I figured years ago that if I were to get pregnant, my maternity care would be covered. But that’s not so! Maternity insurance is a separate a la carte add-on (mine was $70/month more to add) but then if you get pregnant, all the normal rules of your insurance plan kick in (deductible, etc). I had to wait 6 months to conceive after adding it (so they could get their money’s worth out of me) and I’m not sure yet if I’ll drop it between kiddos or not. Cool, thanks for the good info! I think sushi is the thing I have missed most. I often think about Japanese women and how I’m sure that sushi is still a part of their normal pregnancy diet (and likewise how uber fresh the fish is) while still producing normal Japanese babies. I even tried cooked sushi to celebrate my birthday but it just wasn’t the same. 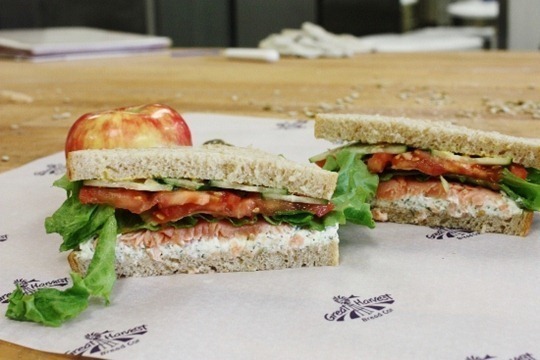 I haven’t heated up smoked salmon yet – maybe I’ll try that! Ideally we’d have them 3-3.5 years apart, but we have no idea how the timing will go! Great post! Very informative and nice overview. 🙂 Thanks for taking the time to type all of this information. Great comprehensive post!! Funny on the juice thing– I also totally craved it throughout my whole pregnancy, and now– GONE! Funny how your body just kind of knows what you need. Kath, thank you so much for this post! My Husband and I are in the early (1st month) stages of trying and I will definitely revisit this post when the time comes! It was so informative and you really made it easy to understand. My favorite babykerf post so far! This is a great, comprehensive post. 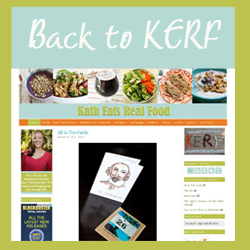 Your main readers on KERF are missing out! I don’t think it would be a bad idea to cross post. Or is that a no-no? I linked over to it! Great post! So much great information for soon-to-be pregnant, pregnant, and non-pregnant women. I am done having kids and wish I had this detailed information during my three pregnancies. I can’t wait to be able to eat normally again – as you mentioned, I feel like I’ve been eating – and feeling – like complete crap! I’m 12.5 weeks and still waiting for my appetite to come back! And I, too, seriously crave OJ… but it will truly be weird if I start to crave milk. I’ve hated it my whole life! Great post Kath! I always enjoy reading about your sensible, down to earth approach to nutrition! I had one month where I gained a high amount of weight as well, and then only 1 or 2 pounds the next. I like to call that month “extended holiday season.” ha. I think the end of pregnancy weight gain has been hardest for me, psychologically. You get weighed once a week and the number keeps going up. I am happy to gain whatever the baby needs, but I think it can be hard to wrap ones mind around, especially someone who has lost a significant amount of weight in the past, as I have. Loved this post! It’s all stuff that I know (I better know it for the RD exam!) but it’s nice to see all in one place. I’m totally bookmarking for my far-in-the-future pregnancy. Awesome post. Wish I had this while I was pregnant! You should really share this as widely as possible! A lot of women are hung up on a lot of old information! Do you have a way that you track the amount of nutrients you are getting each day? I’ve found a couple websites that do this but they are cumbersome to use. I want a way to ensure that I’m getting all the nutrients my baby needs and to know when I need to eat more of this or that (or cut back!) Thanks!! Wow, loads of info and I always enjoying reading everyone’s take on the whole cheese matter. And thoughts on it all in general. I really enjoyed reading this and it’s definitely going to be helpful for a lot of pregnant mommas. You are doing such a great job of taking care of your little one already! Okay, it’s always in my nature to want to stick up for the people that aren’t present to defend themselves and Whole Foods, in my opinion, is doing a GREAT job at remaining aware of what’s environmental and should be standard practice for a grocery store in terms of what items they carry and whatnot. While they probably have a few questionable items like the Barramundi, nobody’s perfect and I don’t think it should be a ‘shame on them’ situation. That’s just not fair. We all know WF is a huge chain and it’s better to shop locally anyway, so I honestly think they should get a pass once in a while if we’re still shopping there. Just like people that are super (and unnecessarily) harsh on your posts at times, I feel like the shame on them is totally unproductive and unfair. Just my two cents. I was pregnant and had baby #2 in Germany and it was funny to compare the food restrictions they suggest for women in Europe (or at least Germany) versus those that they suggest for women in the US. My German doctor had no concerns about cheeses or deli meats or hot dogs – in fact, as far as I know these are just not really concerns among pregnant women in Germany, but she was adamant that I avoid ground beef. The German approach really is far different from the US approach and it really made me consider the context of some of these suggestions especially things like unpasteurized cheese and sushi. Sushi is another one of those things that is recommended against in the US and in other Western cultures. In parts of Asia women eat sushi (btw, by definition raw) throughout pregnancy with no ill effects. Yes, I know that in the US it’s suggested that raw fish and unpasteurized cheese be avoided. In my experience in Germany (and from what I’ve heard from Japanese and French friends) these foods, especially unpasteurized cheese, were not a problem for pregnant women to consume. They definitely treat pregnancy very differently in Germany and this is really just one of the many differences that made me realize how culturally constructed some aspects of pregnancy are. I’m not advocating for one approach over another but it is interesting to start “deconstructing” the rules of pregnancy a bit. Canadian 2nd time mum here, and we’re also given the all clear to eat soft cheese, deli meats and raw fish. Honestly, if I didn’t have the option of sushi, I probably wouldn’t have eaten at all in my 2nd trimester of this pregnancy, for some reason it was the only food that appealed for months! I think the US guidelines are based more on “better be safe than sorry,” and I’m also willing to bet many women don’t stick to as strict dietary guidelines as might be suggested. For me, the changes were so minimal (I don’t eat much deli meat, raw sushi or unpast. cheese) that things didn’t change that much. Great post! Just wanted to point out that Listeria can do more than harm the baby and can actually lead to fetal death. Listeria has the highest case fatality rate of any foodborne illness b/c of this. This is a great post. While reading about the ways you’ve incorporated more protein into your diet, I got to thinking about the protein that so many vegetables provide as well. What are your thoughts on vegetable protein vs. dairy, meat, etc.? I know it was tough getting in a lot of veggies at first while you weren’t feeling so hot! Thanks! I am big on bioavailbity, and I personally think the protein in animal products and beans is a better source. I wouldn’t rely on vegetable protein alone (meaning cutting out food groups). That said, it surely counts. It seems like you’ve increased red meat consumption during pregnancy, and I wondered if you have noticed a change in your cholesterol levels? I’m not pregnant but I have anemia. My dietician told me that I had to separate out any dairy and eat it several hours apart from my sources of iron because calcium keeps your body from absorbing iron. It made me so sad to give up overnight oats!! 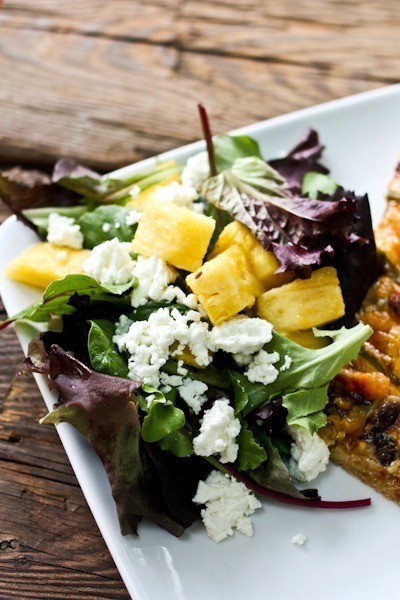 It looks to me like you mix dairy into many of your meals–do you not agree that this limits your iron absorption? You are absolutely right. And I meant to mention that this is another reason why I take my prenatal at night. Can you take yours then too so you can enjoy overnight oats? I’m not pregnant, nor will I ever be again, but I loved this post so very much Kath. Thanks for posting it. BTW I tried the sardine salad over the weekend and it was very good. Just curious which Vega you like. I’ve got one and I really don’t care for the taste! Very helpful post indeed. Thank you! I am planning on trying to get pregnant in the next year or so and wanted to get started on some prenatals. I like the Whole Foods suggestion since I have really enjoyed the 365 brand. However, do you have any advice for someone starting to consider prenatals? What is really important, what are things to avoid? I know this blog is your opinion and experience, but I would be interested to hear what worked for you and what you have found in your research! Even though I feel pretty great, I still have a very sensitive gag reflex and can’t get down standard prenatals. I’ve had to switch to gummies, and while I’m sure the ingredients aren’t perfect, I feel better being able to get some vitamin down rather than nothing. I am looking forward to being able to eat a bit more balanced diet. Had a conversation with my cat (!) this weekend, letting her know that in 5 weeks (hopefully! ), when I’m out of the first trimester, I’ll be able to start eating “normally” again. I have been carbing it up – and dinners do not sit well with me. Thanks for sharing all your tricks, and what you feel is important! I know that I should be eating more red meat, but I can’t imagine eating a well-done steak or burger… Will have to ask my doc about that one today! FYI – Just had my 8 week appt – and the doc said it was perfectly OK for me to eat medium beef in burgers & steaks, even when eating out! I typically only eat beef that is grass-fed anyway (and it says so on the menu), but I’m SO glad that I can have a burger again! This is a great post! I used to love to eat canned fish until I learned about all the dangers of BPA and am not too keen on anything canned now. Is this something that concerns you? Do you look for brands that do not have BPA? Or know of anything? just saw these at costco the other day and bought some Tuna and sardines. any good?? I am typically a Chicken of the Sea girl but Wild Planet pulled me in with the positivies listed on their packages. haven’t tried it yet though. sitting in the pantry. also…embarassed to say, I have never had sardines before. how does one, uh, eat/prepare them? Great, informative post! Thank you so much for writing this. I’m allergic to dairy and really struggling with my calcium intake, especially now that I’m pregnant. I’ve done some research on this, but would love any suggestions you have for non-dairy calcium sources. I’ve talked with my doctor about this and she recommended a supplement, but I’d really like to get this nutrient from whole food sources if possible. Thanks! Haha…I knew the sardines comment was coming!!! I just don’t know if I can stomach them. 🙂 Thanks for the link–very helpful list. There is something to make sure you talk to your doctor about towards the end of your pregnancy or at your first postpartum. Having your thyroid checked. With my first pregnancy I gained 50lbs, but wasn’t diabetic. Baby was 10lbs and healthy and I lost most of the weight within the first 4 weeks, but I had virtually NO milk production. Back and forth to my OB/gyn and a local lactation consultant and we couldn’t figure out why. I still bf for months but couldn’t do exclusive. With #2, right before I ttc I was tested for some odd symptoms and found I was Hypothyroid. With #2 I gained only 22lbs, and baby weight 8lbs. Plus I had a ton of milk supply with her. Pregnancy is a time when hormones are just kind of shifted around and fluctuate, which is what can sometimes cause someone to go into hyper or hypo thyroid. And it can affect milk supply. When I realized, I was pretty upset that my first Ob didn’t suggest checking my thyroid levels. It’s something I now tell every new mom I meet, because breastfeeding is wonderful but having low-supply can make it a very stressful situation. I personally feel that with it being fairly easy to check, thyroid function should be checked after each pregnancy. Especially if milk production is an issue. I totally agree! I think a thyroid work up should be a routine part of postpartum care. Great post, Kath! Very informative, and easy to read! 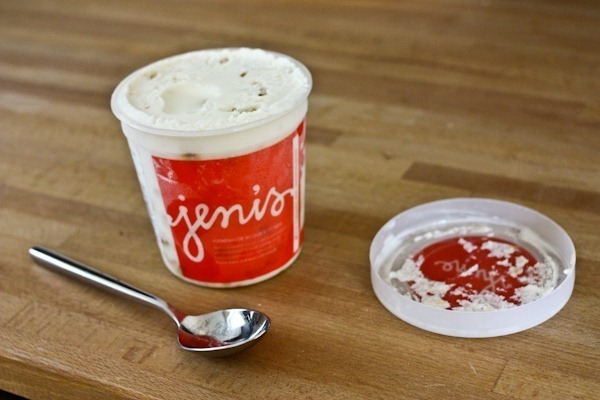 Gotta love Jeni’s icecream, and especially since it is grass-fed! We need to incorporate more fish into our diet! We are actually eating fish tonight, but need to make it at least a once a week occurrence. Thanks for the super informative post Kath!!! I’m 18 weeks pregnant right now with my first baby and I’m a vegetarian, so I’ve been trying to be careful with my diet to make sure I’m getting everything my baby and I need. But I do still indulge sometimes with ice cream and my favorite- chips and salsa!!! I had a question for you though about listeria – recently I was eating a DQ blizzard and someone pointed out to me that I shouldn’t eat it because it’s made with soft serve ice cream and those machines can harbor listeria? Of course I got all worried and anxious about this thinking that I hurt my baby, and now I’m avoiding soft serve IC/fro-yo (even though I want it!!!) … just wondering your thoughts on this and what you have heard? I said ” listeria be damned” regarding soft serve. I think it’s a symptom of our societies hypersensitivity during pregnancy. I have had soft serve at least 10 times during this pregnancy. Oh, where was this post 12 years ago when I was pregnant? Great post. Added sugar is everywhere isn’t it? I’m not surprised that the yogurt has more sugar than just plain old ice cream. What is truly sad and scary is how many people don’t know that. I have a hard time with Whole Foods because you have to be extra careful and the labels. I took my daughter there for some gelato and the first or second ingredient on every flavor was corn syrup!!! I was floored!!! Only 10 pounds in 20 weeks, that is amazing!!!! Good for you!!! Great post, Kath. My best defense against all-day sickness was definitely protein. Even though it was hard, I tried to eat eggs often because they truly helped me. The next time I get pregnant, I’m going to try even harder to get as much protein as possible. I’ve recently decided to start eating fish again occasionally, so that should help! Anyway, just wanted to say this is a great, well thought-out post. Great post. Thanks for putting all this in one place!! Wonderful post! Do you count/track calories at all? What do you aim for? I’m 10 weeks pregnant right now and have had completely hellish morning sickness since the end of my 5th week. All I can consume/keep down these days is a couple glasses of milk, every couple days I can manage a bowl of cereal. My OB said my ultrasound looked great and the baby is doing great, which is good news cuz I was really worried, but not being able to eat hardly anything is really scary. I’d love to be able to eat even part of what you’ve listed here, and I hope that when I clear the first trimester I’ll be able to eat better. But the good news is apparently even if, like me, you simply cannot eat properly, the baby is pulling what it needs from you. I don’t want to push drugs, but did you talk to your doctor about them? They saved my life. Yeah, I got Zofran prescribed middle of last week and it helps somewhat, but not enough for me to eat much more than I have been. Tried the B6 + unisom as well, can’t keep B6 down. This is such a great, informative post! Although I have no intentions of becoming pregnant anytime in the near future, I still like this post was really helpful. Thanks so much taking the time to write it up and share your experience! Kath – are the protein guidelines you listed pretty much across the board? I’m only ~31.7kg and not pregnant, but I’ve been thinking my protein RDA was a minimum of 55-60g. This is way too high by your count, but I’ve just gotten that off of Sparkpeople.com’s recommendation, not from my doctor or anything. What do you think? 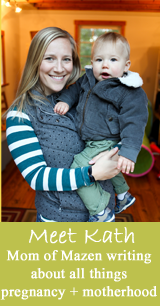 I became absolutely obsessed with nutrition (and continued to be) when I got pregnant. I am SO happy to read about someone else who takes it all very seriously. After reading a lot of books on nutrition that is best for baby, I changed my diet almost immediately and has stuck to most of the new habits. My “cravings” became orange juice, cereal, and spinach. It’s amazing how a pregnancy can really bring out the best in us. This is a great post! Love all of the info. I just had my first baby 3 months ago, and still love reading about others’ pregnancies. I have a few friends that I’m going to send this to, though! Great post. I was all about the canned salmon from Trader Joe’s or Whole Foods, thinking eating a can a week would give me lots of cheap good fats- then I noticed that there are only a few grams of fat in each serving! I found the cheaper regular-supermarket kind (with skin) has lots more fat- which is what I’m after. I noticed you mentioned yummy ice cream in your post. Well, lately I’ve become a huge fan of greek frozen yogurt! So yummy! 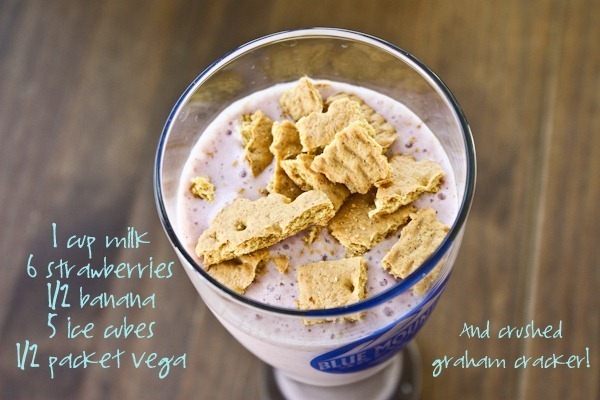 Open Natural makes it, but I’m partial to the Ben and Jerry’s Blueberry Graham. May I ask what is wrong with the Indonesian Barramundi? Is it unsustainable? Unethical? Not sure also what you mean by “red” seafood. I have been to Indonesia loads of times, and gotta say the food I have had there is top quality (not in a capital city either, in regional centres), in both freshness and sustainability. Ah okay – didn’t know about the mercury, but not really sure about the sustainability – readers might be interested to see the Australis Barramundi website (http://www.thebetterfish.com/about-us) who claim their imported fish is sustainably farmed? Unless they’re lying….? Thanks for this fantastically helpful post. I am 15 weeks pregnant and have been using a lot of your tips on pregnancy foods to build my grocery list. Thanks again! Thank you so much for this post. So informative!!!! I love this information so much. It’s far better than any other sites. I am currently 16 weeks pregnant. I try to be a healthy eater for my baby and myself. I try not to stress out over being healthy like you said. Like you I would like to eat real food, instead of depending on supplements. Then, I became wonder if going with non-fat is better choice than low fat to manage the right weight gain. I am not RD, so I would like to hear from you about the health facts on these. Does non-fat take away good nutrition or add chemical to keep good taste? In your oatmeal what kind of cottage cheese do you use? Thank you for reading my comment. Fat is super important! Definitely don’t go fat free. Thank you for the assurance. I will skip nonfat and get more good fat!